If you weren't able to join us at the Friends previews for this year's Summer Exhibition, we hope you will join us to explore over 1,200 works by established and emerging artists, including new pieces by some of the most significant practicing artist duos today: Gilbert and George, Jane and Louise Wilson and Jake and Dinos Chapman. 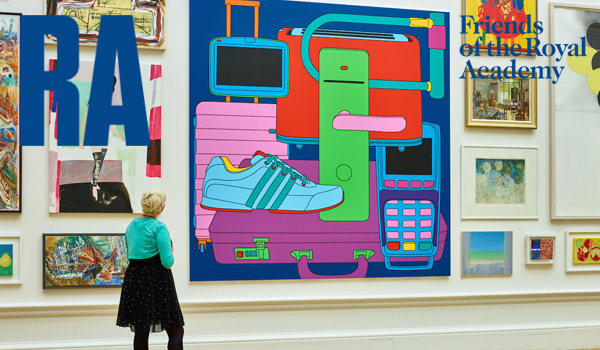 Get a taste of what's on offer with our Summer Exhibition Explorer. Re-visit your favourite artworks from this year's show, discover those you might have missed, and for the first time this year you can purchase many editions online.Start exploring now. A percentage of proceeds from art sales goes to support the non-profit making areas of the Royal Academy including the RA Schools. Please note: even if you have a Friends or ticketing account already, you'll have to create a new account to purchase works on the Summer Exhibition Explorer. We apologise for any inconvenience. Thank you for your continued support of the Royal Academy of Arts.